I Wore the Ocean in the Shape of a Girl is Groom’s first foray into prose in the form of a memoir. Derived from her personal journals, her memoir is an impressionistic stream of consciousness filled with memorable images and magnificent metaphors. Each page poetically reflects the dramatic events of her personal journey as they occurred with concomitant poignant and yet unsettling observations; however, the imprecision of the writing style makes it a difficult read. As a chronicle of each day of her lonely and desperate descent into the nightmare of alcoholism, I Wore the Ocean in the Shape of a Girl is an unabashed bird’s-eye view of the consequences of unhealed wounds of both childhood and young adulthood. She appears to turn herself inside out to reveal the naked reality of a life gone terribly wrong. At age 19, after the birth of her son, she felt a great sense of “belonging to him.” And yet, she made the painful decision to allow her aunt and uncle to adopt him. Her agony is poignantly expressed by the painful words “It’s as if I am an orange, an apple, some fruit with skin that a knife has been taken to, cutting.” This was the tipping point that led her deeper into the abyss of loneliness and addiction. At first blush Ms. Groom’s writing style is captivating, drawing the reader into the insights that result from each catastrophe experienced by the author. Yet ultimately the reader can become exhausted from the heightened vigilance required to immerse oneself in each impending disaster in this saga of the chaotic life of addiction and self-destructive behavior. It is difficult to sustain interest in the author’s ongoing drinking binges, blackouts, and desperate sexual encounters that sound dispassionate and detached at times which, coupled with extensive repetition, can become quite tedious. It is not the subject matter of Ms. Groom’s memoir that causes the main concern to the reader, but the fragmented style of the stream of consciousness. For example, verb tenses often shift within and among proximate paragraphs, creating confusion about past versus present without clarification. Whether this is intentional or not, it does not contribute to the clarity of the author’s vision. The structure, chronology of events, and plot development are also disjointed, confusing, and difficult to follow at times. 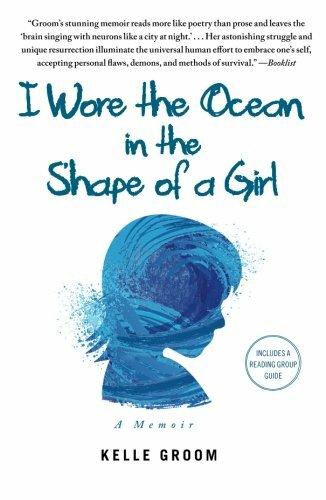 I Wore the Ocean in the Shape of a Girl appears to be an example of the difficulty some poets have in translating poetic images into effective prose. While powerful images are effective in poetry, prose requires greater structure and continuity. There are many adjectives to describe this book including gritty, evocative, imaginative, chaotic, excruciating, and tragic. Unfortunately, as a result of the limitations of this type of stream of consciousness, this work may attract a limited audience. After reading I Wore the Ocean in the Shape of a Girl, one might ask oneself “What is the meaning behind this work?” similar to how one might feel while observing a piece of art in a gallery that is beautiful but confusing. Though Ms. Groom’s style is an interesting technique, the fragmented nature of this work mars the powerful insights by the author.